I feel fortunate to have followed some of the amazing major changes in digital marketing and technology over the last 15 or 20 years. I’m sure you will have enjoyed living through, following and acting on these changes too. 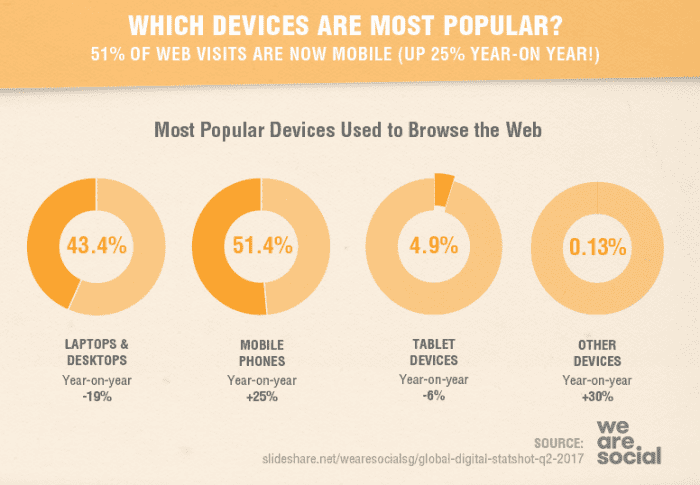 Looking back, we’ve seen a phenomenal growth in the importance of organic, then paid search, then social media and more recently, incredible worldwide growth in mobile and particularly smartphone usage. Looking forward, in this article, I’m going to review 10 new trends which I believe, based on my experience consulting and training, are relevant for marketers across businesses of a range of sizes. But, first, I’m interested to know what you think will be important to you and your business in 2018. 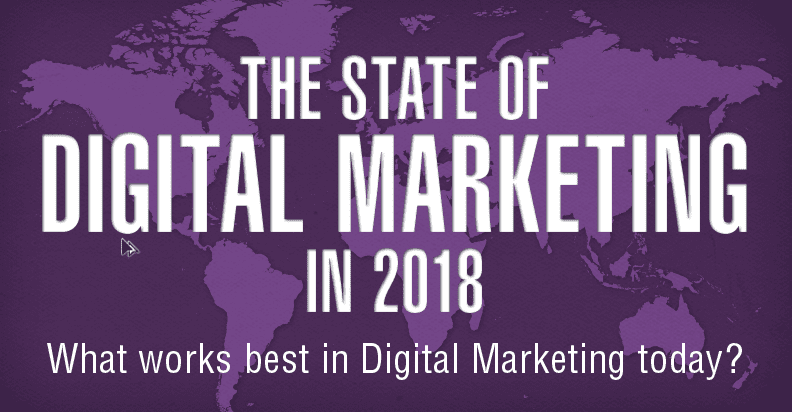 It’s no surprise to see content marketing ‘top of the pile’ since this has been in the top three for each of the years we have run this poll. We see content marketing as the ‘engagement’ fuel that powers all digital communications from search to social to email marketing to creating website experiences which convert. 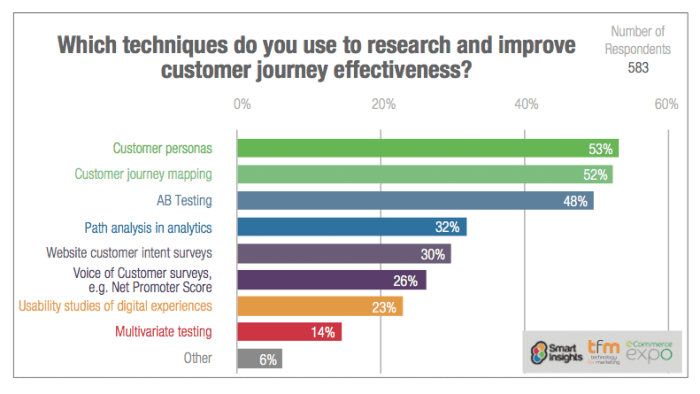 Our content marketing toolkit is popular since members want to learn a more planned approach to mapping content against personas across the customer journey. More of a surprise is that Big Data is in second position. I think this is because marketers are aware of the potential of using data as what we call ‘actionable insight’. To help the decision on which technique to choose, we expanded upon the short labels you see in some polls to help scope the response more carefully. ‘Big Data’ is a nebulous term, but when we expanded the definition to include insight and predictive analytics, it shows the value of the specific marketing techniques for Big Data and this help explains why this is in position number two. In third position is Artificial Intelligence and Machine Learning. We added this to the poll this year with the interest in it and it’s ‘straight in at number three’! It’s good to see the interest in these techniques which we have been covering a lot on the blog and in our member resources this year. In trend 8 we show how different AI techniques can be mapped against the customer lifecycle. If you look at the 14 themes that we covered last year, none of these top-level marketing techniques are especially new, so it’s difficult to describe them as new trends or innovations. However, techniques like Big Data and analytics, Content Marketing and Email/Marketing Automation have continued to grow in importance and will be used by many businesses. So in my look at the trends this year, I’ll be looking at integration as the theme. 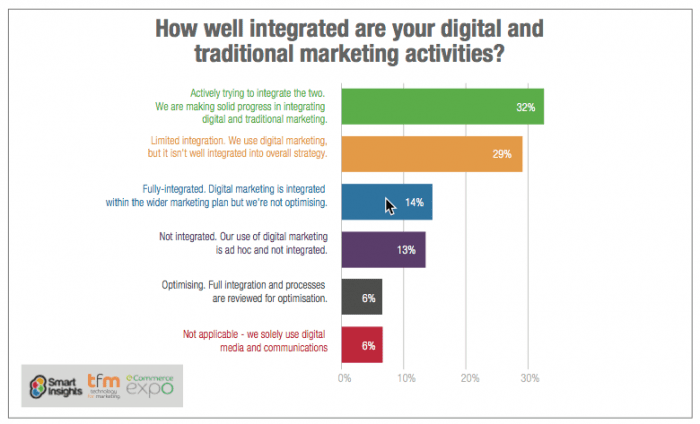 In our research on managing digital marketing (another free member download) you can see that only 6% of companies thought their integration process was completely optimised, yet many are actively working on integration. Integrated marketing communications or IMC isn’t a concept you see written about much on blogs or social media since it’s high-level with everyone getting excited at the latest minor innovations from the frightful 5 – at the time of writing we’re getting excited about the Animojis in iPhone X for example. Fun, but they’re not going to help deliver the most relevant message and offer for an individual, which is the aim of IMC. So, let’s take a look at the 10 trends. You’ll notice that in a lot of these predictions, I’ll refer to Artificial Intelligence and Machine Learning. It’s what I see as the biggest trend to consider in the year ahead. There has been a lot of hype around it in 2017 and we’re starting to understand the opportunities. In 2018 it will become more about selecting solutions and implementation. To support this, the way I like to think about how to improve the effectiveness of digital marketing is to think from the customers’ viewpoint of the communications opportunity available through the customer lifecycle for different types of business. We designed this mind-tool to help members think through all the potential touchpoints across paid, owned and earned media. Then you can perform a ‘gap analysis’ of the use and effectiveness of lifecycle comms you are using against those you could be using to increase the relevance and response of communications. 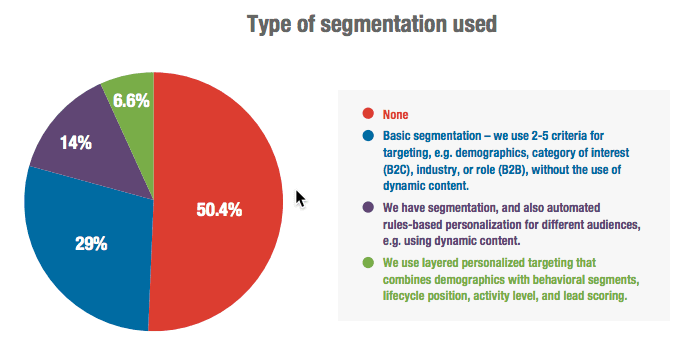 Personalization can also be applied across the lifecycle in email comms. 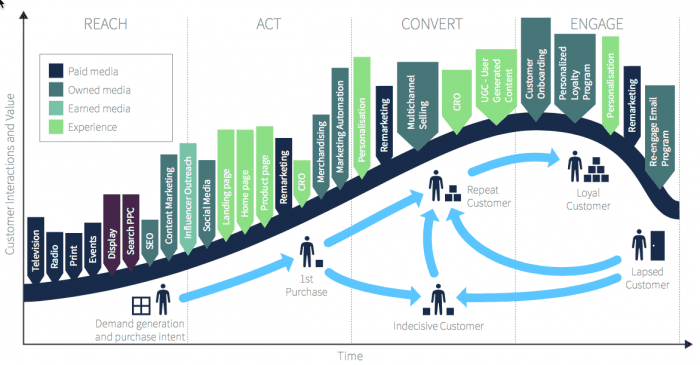 Yet, our research on email marketing shows that despite the widespread use of email and marketing automation systems, many companies don’t manage to put in place a full lifecycle contact system like that shown in the lifecycle visual above. Although email marketing automation is another technique where artificial intelligence and machine learning is being applied more often. 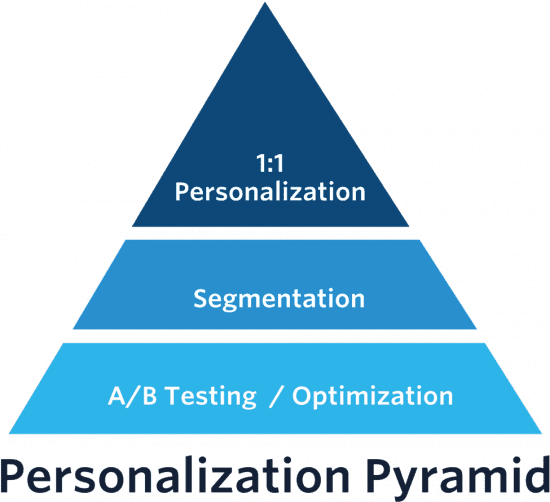 Using machine learning offers opportunities to automate targeting as it does for web personalization. However, personalization is potentially more difficult since emails, by their nature, have more complex creative. This data suggests to me that many businesses aren’t ready for AI and machine learning within email marketing and they need to deploy fundamental triggered automation features first. We’ve been looking at some early adopters of marketing applications of these social messaging apps on Smart Insights. Examples include using Pizza Hut using Messenger for booking tables and IKEA for customer research. Augmented and Virtual Reality are closely related to video engagement, but although we’ve been tracking these, we have seen fewer examples and case studies this year. So, do let us know of any examples. The trend I’m seeing here is that businesses are getting serious about treating content as a strategic resource, that means developing a customer engagement strategy using different media as shown in the lifecycle diagrams above, and at a practical level, developing content for different audiences using techniques like Personas and Content mapping. Our research shows that these customer-centric analysis techniques are growing in importance, which has to be a good thing for consumers and businesses! If we look at the top digital sales channels, search marketing is dominant. Social media is far behind in most sectors, despite its ongoing popularity with consumers. We now know that in many sectors social media can be a great tool for engaging audiences with a brand and improving favourability and awareness, but it typically doesn’t drive lead volume or sales. So I haven’t given social media it’s own section, although integrating it with other channels like web, search and email marketing remains relevant. See our recap of SMW London for the latest social media trends. However, within search marketing there is today relatively little innovation that we get to hear about compared to the past. 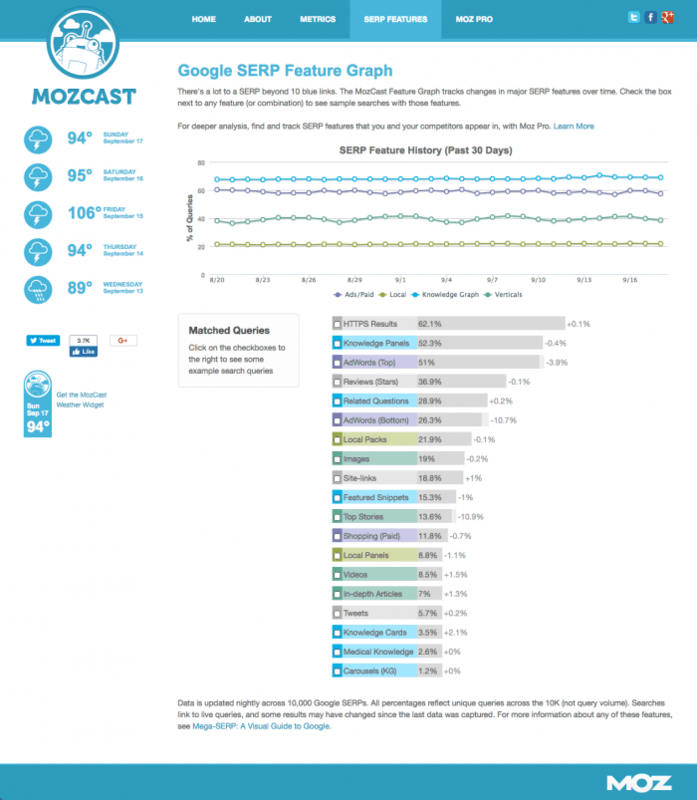 Looking at natural search shows that the Moz algorithm change history has no entries since the non-specific ‘Fred’ update in March, whereas in previous years it would have had 5+ with new updates to Panda and Penguin. 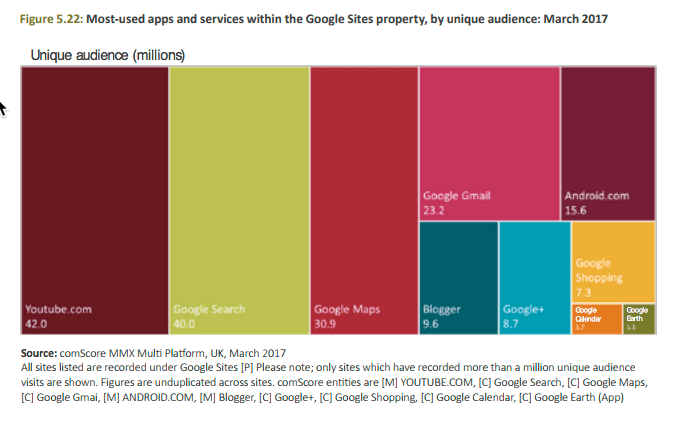 This is partly down to Google sharing less, with Matt Cutts no longer actively evangelising, although updates are available from John Mueller in their Search team. Within AdWords, referencing Google’s list of new features shows more innovation. Much of it is around reporting compared to new ad features for mobile in previous years, but there are some new options like with Enhanced CPC (ECPC) bidding and Smart Display campaigns. This is an example of Google deploying different types of machine learning including Automated bidding Using Target CPA as a basis; Automated targeting which means your ads increasingly show where they’ll get you the most business and automated ad creation from the building blocks you provide, like headlines, descriptions, logos and images. If you follow applications of marketing technology you have almost certainly seen Scott Brinker’s Martech landscape which has grown to over 5,000 vendors this year. You might expect there would be a trend to increasing use of marketing clouds, but our research suggests there isn’t widespread adoption of these. This challenge was highlighted to use recently in our members’ Facebook group where a member asked about tools for integrating insights from different paid media ad serving tools which can give the best results if managed separately, for example, Facebook, Twitter, LinkedIn ads and Google AdWords. Rivery.io is a new option that has launched recently, that should do well. The trend here is new integrated media insights tools other than Google or Adobe, which can help you compare performance of different media. These services are surprisingly expensive, particularly since they are additional analysis tools. They’re not martech that directly increases leads or sales to the business. For example, I was recently recommended this service (Funnel.io ) that costs a minimum of $200 / month, even if it’s solely used to integrate data from multiple sources into Google Sheets. It’s a lot when to get the value from these tools you have to ringfence time so that the analytics are reviewed and acted on sufficiently. Our digital marketing tools wheel contains many free and paid sources of insight about your digital marketing. Here, I’m talking specifically about services which help you stay up-to-date. We’re avid users of these services since they help us keep readers up-to-date via our own blog, twice weekly newsletters and monthly What’s Hot feature. In a recent article on keeping marketing teams up-to-date, Mark Kelly explains that we recommend using Feedlyas a way of aggregating primary marketing news sources via RSS. 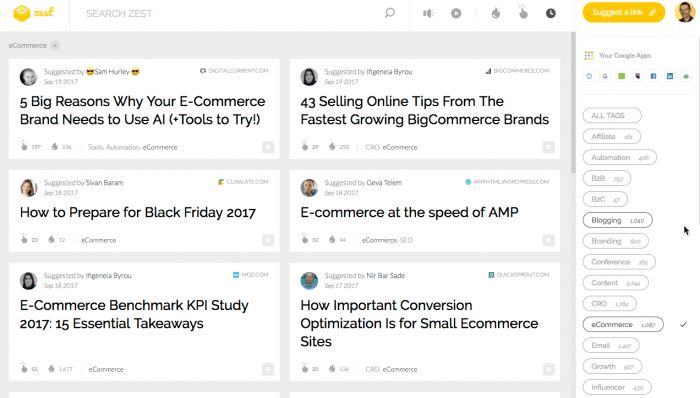 Plus, I recommend taking a look at Zestwhich is a Google Chrome extension, new in 2017, which I and the team at Smart Insights use and is well worth checking out. Its curated content is specifically designed for and updated by marketers. Like Feedly, you can use it to review the most useful content recommended by ‘the crowd’, in this case ‘your tribe’ of marketers. To radically change TV-watching habits. Fortune: Your book describes the success of Netflix’sHouse of Cards as a turning point for the entertainment industry and digital content. Why was that such a big deal? People have made a big deal about the idea of “binge-watching” as the embodiment of the changing way weconsume media. But, what about the tailored content, based on users’ tracked habits? Which is more important? Carte de fidélité, paiement mobile, chariot connecté… Souriez, vous êtes fichés ! Depuis toujours, les hypermarchés collectent et traitent des données. Mais aujourd’hui, celles qu’ils recueillent sur les consommateurs sont de plus en plus précises et leur analyse devient une arme stratégique majeure pour donner la réplique aux Amazon et autres géants de l’e-commerce dont, on leur annonce tous les jours qu’ils vont leur tailler des croupières. C’est évident : l’avenir des hypers passe par le Big Data (mégadonnées). « Amazon vient concurrencer Auchan et Carrefour avec de nouvelles armes, comme le traitement des données, que ces enseignes traditionnelles doivent s’approprier », clame Yves Marin, directeur chez Wavestone. La route est longue. Un seul chiffre : l’américain Walmart, numéro un mondial de la distribution, a généré l’an dernier un chiffre d’affaires de 13,7 milliards de dollars sur Internet, contre… 107 milliards pour Amazon, dont l’un des points forts réside aussi dans son système de recommandation. Ce n’est pas pour rien que Walmart a annoncé mardi mettre 3 milliards de dollars sur la table pour racheter Jet.com , un concurrent de la firme de Jeff Bezos. La grande distribution a commencé à se mettre au pas. Les expérimentations se multiplient : rachats de start-up, créations d’incubateurs ou investissements en matériels et logiciels… Walmart s’est ainsi offert la société Kosmix pour monter sa propre infrastructure d’étude en temps réel des données. Auchan Retail Data, l’entité du français Auchan qui gère les données, a quadruplé ses effectifs en un an (40 personnes). « La nouveauté avec le Big Data, c’est que l’on peut personnaliser la relation client à une très grande échelle. Avant, on s’adressait à un segment de clientèle. On est aujourd’hui dans une relation de one-to-one grâce aux capacités de calcul », affirme Olivier Girard, son directeur. Ainsi les bons de réduction susceptibles de vous faire craquer arrivent par miracle sur votre page de navigation et dans votre boîte aux lettres ou mails. Les campagnes publicitaires deviennent plus efficaces. « On constate jusqu’à 40 % d’augmentation des ventes avec notre régie Imédiacenter », note-t-il. Certains, comme Leclerc font appel à des « data scientists », très en vogue chez les géants du Web. L’enseigne fait aussi appel aux start-up, sans forcément les racheter. « Il suffit qu’un acteur de type Amazon sorte une innovation pour que des technologies qui ont à peine quelques mois deviennent obsolètes. Dans ce cadre, investir ses propres billes à long terme est une prise de risques beaucoup trop importante ! » justifiait l’an dernier Michel-Edouard Leclerc, patron du groupe, dans « L’Usine digitale ». Des jeunes pousses ont ainsi fleuri dans des domaines très pointus. « Il n’y avait aucun moyen de mettre en relation les données d’une personne à la fois cliente en magasin et en ligne. Notre société est capable de les associer pour améliorer les interactions avec les clients », explique Vihan Sharma, directeur général de Liveramp, une entreprise américaine qui a Carrefour pour client et qui s’est lancée dans l’Hexagone il y a un an. Elle traite 20 milliards de profils par mois environ en France, au Royaume-Uni et aux Etats-Unis. A terme se profile la possibilité de monétiser les données aux clients : c’est déjà une source essentielle de revenus chez Cdiscount. C’est un enjeu pour les grandes surfaces. Pour l’heure, elles cherchent surtout à affiner le data. « Auchan commence à utiliser des données issues de l’open data, c’est-à-dire celles ouvertes et accessibles à tous sur Internet comme la météo et le trafic routier », pointe Olivier Girard. Quant aux données des réseaux sociaux : « Nous les utilisons peu par peur de se disperser. Ce n’est pas notre priorité aujourd’hui. » Le temps, c’est de l’argent. 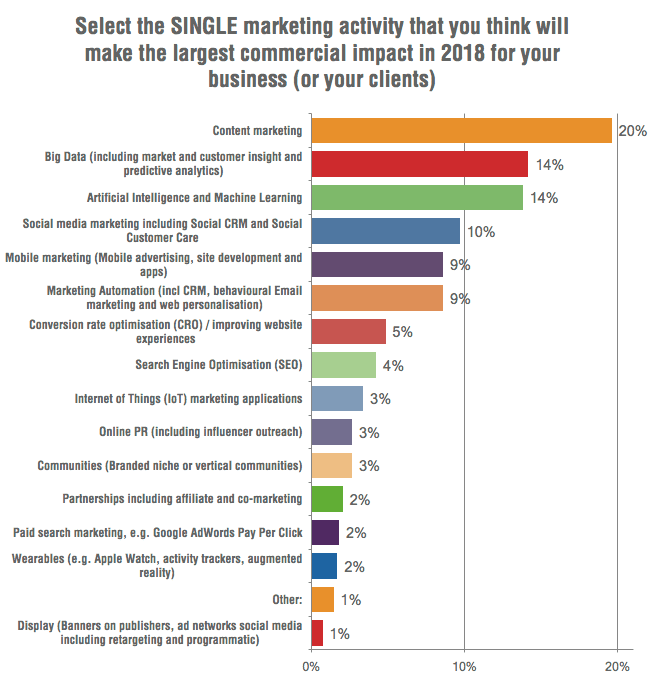 Source: Big Data: How Valuable Is Your Marketing Data? Research from Dun & Bradstreet’s B2B Marketing Data Report 2016 has revealed gaping holes in B2B marketing databases. In a study of 695 million records in B2B companies’ databases, inaccuracies were found in over 70% of the records. The following are some of the primary reasons that you should prioritise clean data over big data to optimise the value of your sales leads. So much time is wasted in organisations looking for the right data. When your sales reps are equipped with thorough, clean data, they can focus their time on converting prospects into buyers. In contrast, it takes time to work through the issues created by bad data. The same can be said for marketing departments when they are trying to guide customers down the sales path, or creating customer loyalty programs. Imagine a rep opening a contact profile in a database and realising that a digit is missing on the phone number or an important line is missing on an address. These missing items impede the rep’s ability to optimise his workflow and begin the selling process. The distraction also takes away from your team member’s focus on optimising presentation and closing stages. 58% of Chief Marketing Officers (CMOs) say email marketing, search engine optimisation (SEO), search engine marketing (SEM), and mobile are the main areas that big data is having the largest impact on their marketing programs. 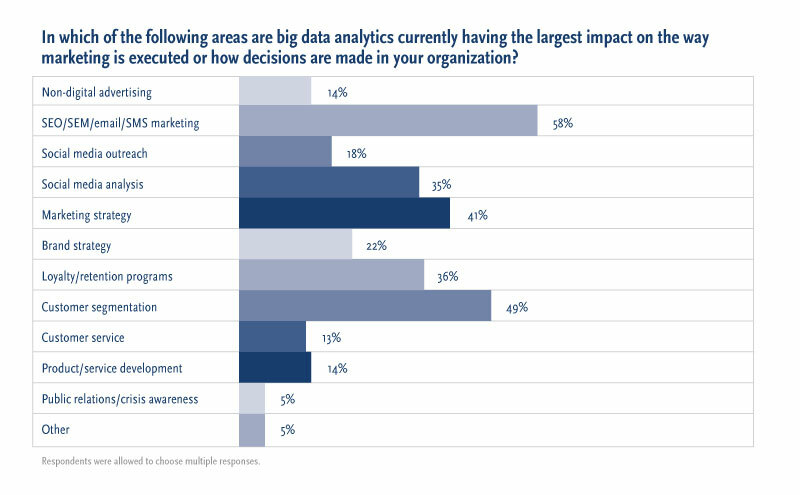 Source: Big Data and the CMO: What’s Changing for Marketing Leadership? Clean data is more useful in landing appointments with high-potential buyers. It is difficult for a person to make targeted prospecting calls when profiles are incomplete or inaccurate. A smaller amount of high-quality sales leads improves targeting capabilities. With quality data, reps can better detect which contacts offer the right opportunities to sell the right solutions. Having in-depth information on B2B buyers is especially important, as your reps need the ability to tailor messages to specific interests. The efficiency with which reps can connect with top decision makers and sell is much lower with bad data. Instead of investing the majority of time preparing and delivering sales messages, reps are taking the time to sort through problematic prospect details. 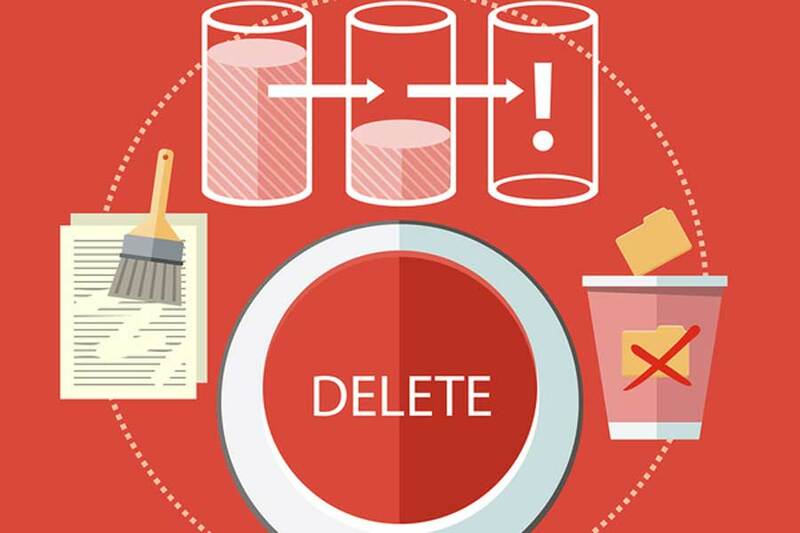 With clean data, you eliminate wasted steps that cost your organisation significantly. Most importantly, clean data gives your team the best opportunities to optimise conversion rates, selling cycle times and average deal sizes. Think of this scenario as similar to a doctor going into a waiting room after reviewing a patient’s file. The more thorough and accurate the nurse’s notes, the greater the doctor’s ability to effectively and efficiently detect and resolve a patient’s health problem. Better sales results drive optimised financial performance as well. It is easier to forecast sales accurately, which enables you to better align budgets with revenue projections. Big data doesn’t do much good if all you have is a cesspool of problems. However, ample data that is clean and useful is of tremendous value to your team. Internal Results has expertise in data acquisition. We maintain accurate data on over 61 million decision makers in more than 20 countries. Over 500,000 records are updated every month to ensure they are clean and accurate. Whether you are looking at entering new markets, or geographical territories, contact us today to discuss why our expertise in clean data is a perfect match for the sales skills of your organisation. Anticiper l’inévitable disruption à venir dans l’assurance – Axa investit 100 millions d’euros dans Kamet, un véhicule inédit à ce jour dans l’industrie. Mais ce n’est pas la seule initiative de la compagnie. Explications. Comme de très nombreuses industries, l’assurance est à l’aube d’une révolution majeure, probablement la plus importante depuis son origine. L’explosion des objets connectés liée au développement exponentiel des technologies mobiles, l’évolution des modes de consommation (économie du partage, économie du “on-demand”,…), mais aussi les opportunités offertes par le “Big Data” en termes d’analyse du risque et d’anticipation des comportements et des événements, ouvrent d’immenses opportunités en matière de prévention et de gestion des risques. Dans 10 ans, l’assurance aura un visage très différent de celui d’aujourd’hui. Les besoins et attentes de protection des individus et des entreprises ne disparaitront pas du jour au lendemain. Bien au contraire, le monde qui nous entoure fera plus que jamais courir des risques. Mais la façon de répondre à ces besoins, notamment par les sociétés d’assurance, va fortement évoluer. Il est probable également que de nombreux acteurs non “assureurs”, existants ou nouveaux, imagineront et développeront des produits et services concurrents, voire radicalement différents, de ceux offerts aujourd’hui par les acteurs établis. Nous avons compris très tôt que digital et big data allaient profondément changer ses métiers (assurance des biens, assurance des personnes, assurance de la santé, épargne et gestion d’actifs). Depuis plusieurs années, un plan massif de transformation a ainsi été engagé sur l’ensemble des métiers et régions couverts par Axa. Nous avons développé plusieurs initiatives globales visant à aider et accélérer les efforts des équipes opérationnelles. Un “Data Innovation Lab” (DIL) a été créé à Suresnes et rassemble une soixantaine de data scientists qui travaillent avec les entités opérationnelles sur la mise en place d’initiatives autour du big data. Le DIL double de taille chaque année et vient d’étendre ses équipes à Singapour afin d’être encore plus proche de nos entités asiatiques. Deux “Axa Lab” ont également été créé, l’un à San Francisco et l’autre plus récemment à Shanghai. Véritables têtes chercheuses, ces équipes sont au plus près des écosystèmes d’innovation, identifient des nouveaux modèles et mettent en relation start-up innovantes et équipes opérationnelles d’Axa à travers le monde. Nous avons également créé un fonds d’investissement, Axa Strategic Ventures, doté de 200 millions d’euros et dédié aux start-up de l’InsureTech. Il leur apporte des financements via des prises de participation minoritaires, soit très tôt dans leur cycle de vie (early stage/seed), soit plus tard afin de financer leur croissance et internationalisation (growth stage). Ce fonds a déjà effectué une douzaine d’investissements et est maintenant en mesure d’opérer sur la majeure partie du globe. Toutes ces initiatives visent à permettre aux différents métiers d’Axa de se moderniser en utilisant au mieux ce que les technologies permettent de réaliser afin de mieux servir clients, distributeurs, partenaires et collaborateurs. En complément des nombreuses initiatives mentionnées ci-dessus, il est progressivement devenu clair que des modèles encore plus “disruptifs”, à l’image de ce que Uber ou Blablacar ont rendu possible sur la mobilité, AirBnB sur le logement et l’hébergement, Lending Club sur le prêt à la consommation, allaient immanquablement voir le jour dans le monde de l’assurance. Et il y a fort à parier que ces nouveaux modèles seront en grande majorité imaginés par des start-up. Axa a donc décidé de financer – dans une logique industrielle (et non financière ou d’investissement) – une plateforme qui aura pour mission de développer des modèles disruptifs d’assurance. Ce concept, parfois appelé “Start-up Studio”, vise à créer un écosystème d’entrepreneurs en résidence, un vivier de savoir-faire technologiques afin d’initier des idées, les prototyper et en faire des sociétés qui seront co-dirigées par Kamet et l’équipe de fondateurs. Kamet pourra construire des modèles concurrents des modèles d’affaires existants du Groupe Axa, car l’objectif est bien de ne pas laisser à d’autres le soin de nous devancer ou “disrupter”. Cette structure sera indépendante d’Axa et fonctionnera comme une start-up tout en ayant la capacité soit de s’appuyer sur les savoir-faire des équipes internes, soit de s’allier stratégiquement avec des partenaires externes pour mettre au point des modèles innovants. La mission est ambitieuse. Bien exécutée, elle devrait nous permettre de réussir notre transformation numérique et conserver notre place de marque leader dans le secteur de l’assurance. Il faut bien le dire, la salle Henri Lebœuf était comble aux Bozar et comme toujours tu passionnais ton audience. Avec ferveur et assertif comme toujours. Le visionnaire des grands jours. Quelque part tu as décidé que l’Europe doit changer et va changer. Ce n’est pas la première fois dans ta vie que tu te mets à abattre des murs avec tes poings nus. Puis vint la cession de signatures. Et bon, soit, à un moment où la file n’est pas encore trop longue je fais signer mon exemplaire. Dans notre relation qui oscille depuis 40 ans entre la sympathie et le bougon et qui n’est jamais neutre tu poses la question : « Pour Ivan ? C’est bon ? ». Je te réponds : « fais comme tu veux ». Après avoir constaté que tu écris encore toujours mon nom avec un « Y » au lieu d’un « I » je te dis avant de te quitter : « je commence à lire le chapitre qui commence à la page 117 ». Et je l’ai fait. Et me voilà en plein désert digital. C’est vrai, il faut un cadre juridique unique avec un régulateur unique au lieu d’un tissu disparate de 28 unités. Qu’on est dans une constellation de 28 pays ont leur mot à dire. Et c’est vrai que là se trouve différence avec les États-Unis qui fonctionne sur base d’une réglementation pour couvrir tous ses Etats. Effectivement, pas étonnant que des 25 grandes sociétés d’Internet 15 qui ont leur siège aux États-Unis et seulement une seule en Europe. Et que tout ce que tu cites dans ce passage peux impacter 900.000 emplois en Europe. Que le morcellement européen tue l’innovation. Mais il y a plus. Quand on prononce le mot digital automatiquement le concept « données » s’y attache. Big Data. 90% des données mondiales ont été créées pendant ces deux dernières années. 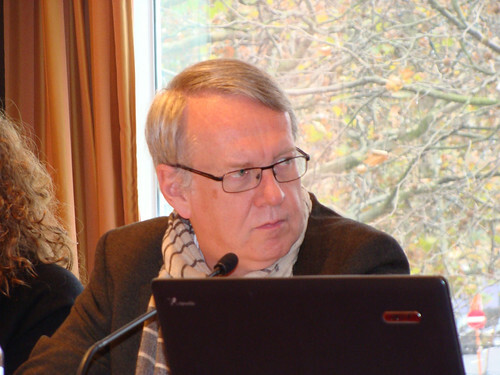 Depuis que la première version de la proposition de régulation sur la protection des données a été émise par la Commission Européenne le 25 janvier 2012. Avec les pouvoirs publics, les entreprises et les citoyens comme utilisateurs de données. La quantité de données croît de façon exponentielle, venant de partout. Nous les créons surtout nous-mêmes par nos interactions avec l’Internet. Ces données contiennent des informations très détaillées sur nos intérêts, réseaux, habitudes et comportements individuels. Il s’agit d’un flux rapide et continu générant de grandes quantités de données. En temps réel, pour ainsi dire. Cela permet aux entreprises d’amorcer la production de produits hautement personnalisés et le consommateur prend part au processus de production en spécifiant ses exigences de conception. A travers des sites e-commerce, via les centres d’appels. Un nouveau canal de production a vu le jour. Et demain tu pourras virer ton fidèle chauffeur Gaétan. Ce sera en «voiture Google », sans chauffeur, que tu feras tes trajets commandé par ton téléphone mobile. « Data driven ». Littéralement. L’économie se repose donc de plus en plus sur les données. On ne peut plus évoluer à contresens. Il y a un enjeu majeur pour les entreprises en ce qui concerne la transparence dans la relation avec le consommateur ainsi que pour les gouvernements celui de respecter les droits fondamentaux et les libertés des citoyens. Le développement économique allant de pair avec les intérêts des consommateurs. La politique devant être la garante des libertés civiles. La proposition de Règlement Général sur la Protection des Données qui est en discussion au trialogue contient 23 « delegated acts », mais surtout, il y a sur la table des négociations bon nombre de provisions dont l’application serait laissée à l’appréciation de chaque Etats Membres. Ceci va totalement à l’encontre de ton souhait d’harmonisation de notre vieux continent qu’on appelle l’Europe et ne va pas donner un souffle à notre nouvelle économie digitale. Un grand défi reste de trouver l’équilibre entre permettre et interdire. Un enjeu principal parce que notre économie digitale se base sur les données afin de pouvoir concurrencer avec tout ce que existe hors des limites de notre petite Europe. Je te conseille vivement d’aller prendre le thé chez Angela Merkel.